Continuous safety measures are being implemented on board aircraft for the protection of passengers in the air. It’s common knowledge that commercial aircrafts have been targeted by terrorists on more than one occasion. It’s also no secret that if an attempt is successful, then absolutely no-one onboard stands a chance of survival. Governments make decisions to prevent terrorist attacks at all costs. On the 21st of March the US Department of Homeland Security (the DHS) announced new regulations. With immediate effect all electronic devices larger than a cellphone/smartphone are now banned from transportation onboard if routed via the Middle East. The UK Government has imposed similar rules. In other words, all the passengers that are flying to the United States or United Kingdom via certain airport hubs must pack their laptops, tablets, e-readers and anything larger than 16 cm by 9,3 cm in their check-in luggage. If you travel to the USA via Cairo (Egypt), Dubai and Abu Dhabi (United Arab Emirates), Istanbul (Turkey), Doha (Qatar), Amman (Jordan), Kuwait City, Casablanca (Morocco) and Jeddah and Riyadh (Saudi Arabia) then the new rules will apply. If you travel to the UK via Turkey, Jordan, Lebanon, Egypt, Tunisia and Saudi Arabia –prepare to part with your laptop and put it in the hold. 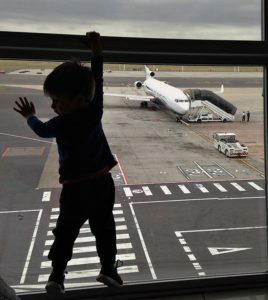 The DHS advised that the choice of the airports is based “on the current threat picture”. It is quite possible that more airports will be added to the list. The presence of Emirates, Qatar, Etihad and Egypt Air is undeniably strong in South Africa and therefore many travellers will be affected by the new regulations. If you have an upcoming trip to the USA or UK and it is routed via above-mentioned affected airports, then we recommend that you make contact with your insurance company to confirm that your policy covers your laptop while it is in a checked-in bag. If you are planning to travel and haven’t purchased your tickets yet, then we suggest that you contact us for our amazing deals on direct flights that would avoid this issue. Currently you can still take your laptop onboard if you travel direct from South Africa. Despite the understandable inconvenience caused by these new regulations we should never forget that safety must be our first and foremost priority. We can always go down memory lane and try to remember the times when people used to fly without any laptops and other electronic gadgets. It actually wasn’t that long ago. 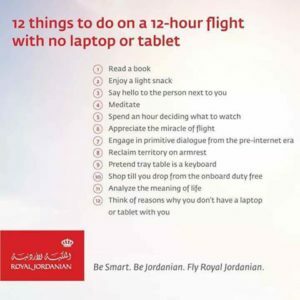 If you need help with finding ways to entertain yourself during a long haul flight, then Royal Jordanian Airlines have prepared a list just for you – enjoy reading below.